It’s a great choice for a German ruler, but what about a little American boy? Thanks to Emma for suggesting the surprisingly wearable Otto as Baby Name of the Day. Like the very popular Hannah, Otto is a palindrome – a word spelled the same forwards and backwards. It’s a quirky quality, but probably not reason enough to choose the name for a son. Otto’s status as a historic and regal appellation is probably a better reason. Flip through the history books and you’ll find three Holy Roman Emperors from the 900s into the 1200s wearing the name, plus nineteenth century kings of Greece and Bavaria. A twelfth century Saint Otto lived in Swabia. Then there’s Otto von Bismarck, the man that lends Otto his Prussian military vibe. Historians debate whether Bismarck always planned to unify Germany or if he was just taking advantage of circumstances. Regardless, Bismarck was appointed by a king but eventually served an emperor. As all things German fell out of favor during World Wars I and II, it is no surprise that Otto fell out of use. But he’d been slipping for years. In the nineteenth century, Otto appeared in the US Top 100. He fell steadily, leaving the Top 500 in the 1940s and the Top 1000 in the 1970s. Of course, the 1970s made Otto a punchline. In the smash hit comedy Airplane, the autopilot blow-up doll is called Otto. Otto, of course, can fly the plane but can’t land, requiring former fighter pilot Ted Striker to step up and save the day. And get the girl. As if the inflatable flyboy wasn’t enough to steer parents away from the name, there’s also the adoption of Otto the Orange as Syracuse University’s mascot in 1980. He replaced a controversial Native American figure. While regional accents could morph your son’s name from Otto to Auto, he’s still an interesting option. Nameberry lists him with Antiques Ready for Restoration. This puts him in the company of the dusty Dudley and languishing Lavinia, but also the fast-rising Adeline and Jasper. If you’re not sure you’d consider Otto a classic along the lines of Henry or Arthur, Otto also appears on Nameberry’s Offbeat Names list, and that might be the better place for him. The Offbeat list also includes new hipster picks like Hazel and Rufus, but also names that might take some real daring, like Pansy and Balthazar. Tobey Maguire called his son Otis – a name that seems even more offbeat. If I had to file Otto, I’d put him squarely in the middle of the two categories. He’s easy to say and spell, and his roots are undeniable. But he is definitely just outside of the mainstream. That might make him too daring for parents who are still surprised to hear Max and Leo in heavy use. But if you’re hoping to give your son a name he’ll never have to share, Otto is a good option. My son is Otto Paul Ernst II. We named him for his great grandfather who was born in 1898 and my Otto was born in 1998. We have used family names for both of our children. We named my son Otto Sebastian. Respect for heritage was one reason, are last name being 10 letters VAN ZEVEREN was another, and finally being a raider fan he is named after the legendary Jim OTTO and SEBASTIAN Janakowski. I like EMIL also as it was my great grand fathers name but the wife not so much. Otto Sebastian is a great name – just fun to say, and a nice balance of the familiar and current, but not so popular he’ll have to answer to Otto V.
Thanks to the link posted today (http://www.nancy.cc/2010/06/07/baby-boy-names-outside-of-the-top-1000/) I spotted Otto just outside the top 1000. Oh that’s a neat connection! I like Otto in general, but for you, I love it! I LOVE OTTO! Otto and Emil are my top two boys names. Loving the German names. I didn’t realize I had an accent, but I’m from California and say auto and Otto exactly the same. I also say Dawn and Don exactly the same. I kind of like Otto despite my pronunciation. It’s a family name on my husband’s side so I’ve thought about it. I don’t think it’d go over very well where I live though. I prefer Otis and I’m kind of surprised that is considered more offbeat. Don’t forget Anne Frank’s father who was named Otto! And the cartoon character from Rocket Power, Otto Rocket. I’m too much of a Simpsons fan to take the name Otto seriously. The first thing that came to my head was his quote: ‘My name is Otto. I loooove to get blotto’. Maybe not the kind of association I’d want for my kid. Still, it’s a nice sounding name apart from my associations. I like Otto, despite the fact that I had a mean bus driver in kindergarten named Otto. I also read, “A Fish Out of Water” as a kid—one of my favorites, in fact! I think that outweighs the negative connotation. I prefer Otis to Otto, though. O names are tough with my last name–which is a bummer because I like many O names for boys. Sara—Titus and Otto would be fantastic!! I can see it go hipster, but I don’t see it getting overexposed. All in all, I think Otto is great. Funny to read this. We are expecting a child and (should the baby be a boy) we’re debating Otto vs. Titus. The name seems sort of doggish to me, but that not be a huge problem seeing how many names are widely used for both people and pets. I think that Otto may be the name of the dog in the Hagar the Horrible comic strip, which could be why I have that impression. Right! THAT is where I remember Otto from! I like Otto – and Oliver and Oscar too. Must be the letter O. The name does have a fishy vibe to me – because of the book ‘ A Fish Out of Water’ that I read as a child and now again to my children. Otto is the name of the pet fish. But that’s not really a problem. The name may be slightly more ‘foreign / German’ sounding than I think I could personally pull off – though it would match the origin of Henry’s name too. I doubt my husband would go for it though. Don’t forget the great Otto Preminger! Wasn’t the Kevin Kline character in A Fish Called Wanda named Otto? Whenever I hear Otto, I don’t think of the crazy character but the devilishly handsome Kline. Otto rings for me as very likable and quirky. I think it has shed it’s stuffy Germanic tone. LOVE Otto! Along with Oliver and Oscar (2 of 3 finalist names for our son), Otto made the list. It would be fantastic to hear of more little Ottos! Another Otto is The Simpson’s bus driver. Isn’t he “Auto”? Or is that just me mis-hearing it with my foreign accent? LOL! Nope, he’s called Otto Mann. I love Otto. I think Otto is due for a comeback. […] There’s another masculine origin for Pimm. […] – She’s a feminine name related to the Germanic Otto, surely a clunky cool pick for boys. […] embrace choices like Cannon and Gunner. 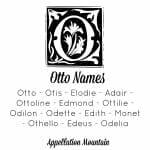 […] loved this list at Nameberry of clunky cool names: Agatha, Ruth, Otto, Leon. […] came 1944′s Oscar-winning Otto Preminger thriller, Laura, based on a 1943 novel.